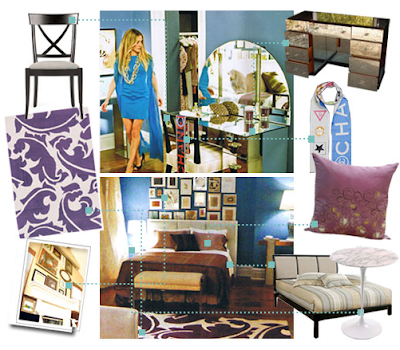 Small space dweller, Carries Bradshaw, shows off her redesigned pad in the SATC film and it exemplifies shades of blue. What a great example of an accent wall of color!?! We showcased shades of gray in Carrie's old place, which acted more of an anchor. In this case, the ocean blue wall color pops as an accent with her decor staying more monotone. Perfect for small spaces! Check out more of these clever Double Takes via Bandelle. 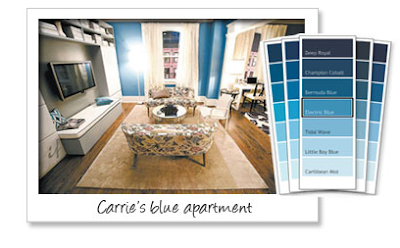 The colors of Carrie's redecorated apartment instantly reminded me of a Tiffany and Co. box. It was a completely chic redesign and I loved it! Oh, you are too kind. Don't you just love her newly decorated apartment! I think the intense blue works so well because it's balanced with a lot of white and mirrored furniture. What color blue are the walls? I soooooo want the same color on my walls.